The hands are the parts of the human body that allow us to interact with the environment. The loss of one limb leads to a great discomfort in everyday life. The loss of both limbs makes a person disabled. Therefore, the task of replacing a missing limb is of great importance. 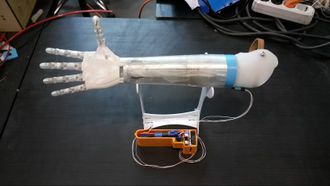 According to the modern science, the development of electromechanical prosthesis that have a strong resemblance to the appearance and functionality of natural limbs is the most likely option. The aims of this work are to develop bionic prosthesis able to compensate for the loss of limbs; to develop control system based on registration of muscle activity; to develop a control system based on determining the prosthesis orientation; to develop a tactile feedback. We use 3D printing and the latest researches in MEMS (microelectromechanical systems) technologies. 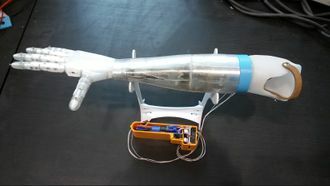 The main conditions imposed on the prosthesis mechanics are: independent finger movement (flexion/extension); the possibility of taking an oversized (cup) and small items (plastic card/coin); the possibility of making a rotary hand movement. The operating period without recharging should be at least twelve hours, a hand should have a very natural form. 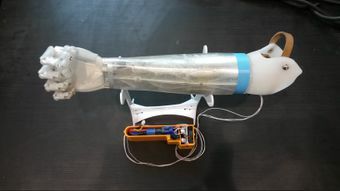 We developed a prototype that has 6 degrees of freedom: each finger flexes/unbends independently from the others Fingers are driven by servo Impact IS45MGD (shaft torque is 10 kN/cm, the speed of shaft rotation at 60 degrees is equal to 0.08 m/sec). The power is transmiting from a servomotor to the fingers by pulling the threads attached at to the tip of the finger at one end, and to the motor shaft at the other end. A supporting frame with fixed engines is made of 2mm aluminum sheets. The motor is handled by microcontroller Arduino Nano 3.0. We developed a manual control mode to minimize the energy consumption: when a movement ends, the engine completely turns off. Picking up objects is made possible because of the friction forces inside the small-sized reduction gear. The value of friction forces is enough to carry light weighted objects (like a phone). The power is supplied by external Li-Pol battery 2.2 mA/h (7.4V, 30C). The prosthesis control is handled by a 6-axis sensor (3-axis gyroscope and 3-axis accelerometer) built into the prosthesis body. Here is how it works: the DCM algorithm calculates pitch and roll axis angles. The angles are measured relative to an initial position of ‘the hand’. If the pitch angle value is positive then ‘the hand’ performs a grasping action. If the pitch angle is negative then the hand relaxes. The roll angle can trigger a rotating movement. For example, if the elbow moves right (or left), the hand rotates clockwise (or counter-clockwise). It is also possible to independently use an accelerometer for the hand control. For example, when one makes a fast and short downward movement, the hand performs a grasping action, and when one make upward movements, the hand relaxes. Only the first method was tested (pitch angle control). The result was positive: the patient was able to manipulate light objects (to use the prosthesis for carrying objects). The prosthesis should be handled intuitively, without making any special movements, as it is necessary for its proper and normal use. The most perspective non-invasive way to achieve it is to use a control system based on the activity of the muscles left on the hand. To register the muscle activity we use electric potential sensors. Some of its characteristics are as follows: electrodes are made of AgCl, its area is 1 cm2; to obtain a signal they need to be in a dry contact with the skin. The signal amplifier is located closely to the electrodes to improve noise immunity of the system. The schematic diagram of the sensors is shown in Figure 2. The result is an electromechanical prostetis prototype for a 15 y.o. girl with inborn atrophy of right arm below the elbow (palm and 2/3 of forearm are replaced by the prosthesis). Arm positioning and dynamics-based control system has been proposed. Electromechanical scheme for registration of muscle activity was designed. Medical examination of girl's hand was carried out in A.L. Polenov RNSI, which resulted into the possibility of using electrical impedance myography of wrist flexion and rotation muscle for prosthesis control system. Golden medal at St.Petersburg technical fair 2016. Project "Functional electromechanical upper limb prostheses with adaptive neurophysiological control system". Diploma of the first degree at international conference "Science week 2015", biomechanics section, report "Development of a bionic arm prosthesis". First prize at "IT breakthrough" 2015 ("IT in medicine" nomination). Project "Development of a bionic arm prosthesis". Silver medal at St.Petersburg technical fair 2014. Project "Robotic arm". Winner of У.М.Н.И.К. program. Project "Development of myographic bracelet". 2015. Exhibition at the session of the Scientific and Technical Council of St. Petersburg News at SPbSTU web page. St.Petersburg technical fair 2016. Project "Functional electromechanical upper limb prostheses with adaptive neurophysiological control system"
Plenum of the Presidium of the "North-West branch of the medical sciences," the report "Functional replacement of upper limbs with electromechanical prostheses". International conference "Science week 2015", biomechanics section, report "Development of a bionic arm prosthesis". St.Petersburg technical fair 2015. Project "Development of a bionic arm prosthesis"
St.Petersburg technical fair 2014. Project "Robotic arm"
Research laboratory “Bionic systems” SPbSTU. Educational and research center “Biomechanics and medical engineering” SPbSTU. Foundation of bachelor program "Biomechanics and Medical Engineering". Nano-microsystems technology specialist: Akulshin Yurii Dmitrievitch. This page was last modified on 27 December 2016, at 13:34.